Glazing Type doors are a perfect option for letting either minimum or maximum light into your property. 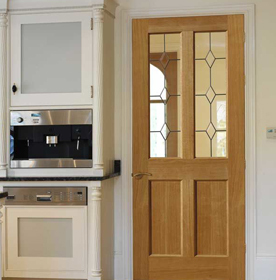 Internal glazed doors are suitable for both traditional and contemporary interior styles. And they offer various advantages, from brightening up rooms, creating unique looks, to creating privacy. Glazed doors allows you to create privacy without closing off rooms, it also allows you to create a sound barrier. We have a multitude of glazing options available, such as, patterned glass, frosted glass and traditional stained glass etc. 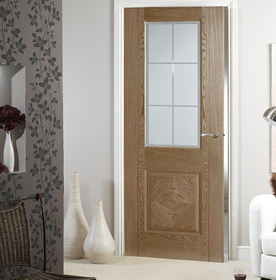 Clear glazed doors are an increasingly popular option, due to the benefits that the products offer. Clear Glazing glass allows rooms to be open, despite door closure. They create an additional source of natural light, to windows whilst retaining warmth and adding aesthetic value. Bestsellers in our range include the LPD Coventry White Primed Clear Glazed Internal Door. Frosted glazed doors bring transparency and elegance to a property. Frosted glazing is a decorative glass option, that allows light to flow throughout, without having to sacrifice privacy. Therefore, these doors are ideal for bathrooms, though they would also look brilliant throughout a property. 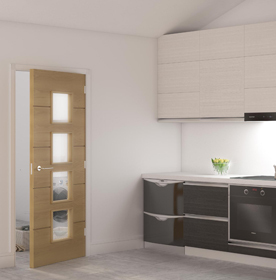 Bestsellers in our range include the LPD DX30 Oak Top Light Frosted Glazed Internal Door. Patterned glazed doors feature glass that offers maximum light flow. along with an attractive decorative feature, which ensures that a property’s exterior or interior stands out. They also improve privacy, as they obscure views. Patterned glazed doors are suitable for both exterior and interior use, and would complement both traditional and contemporary styles. Bestsellers in our range include the JB Kind Oak Cottage Thames 1 Light Glazed Internal Door Unfinished.